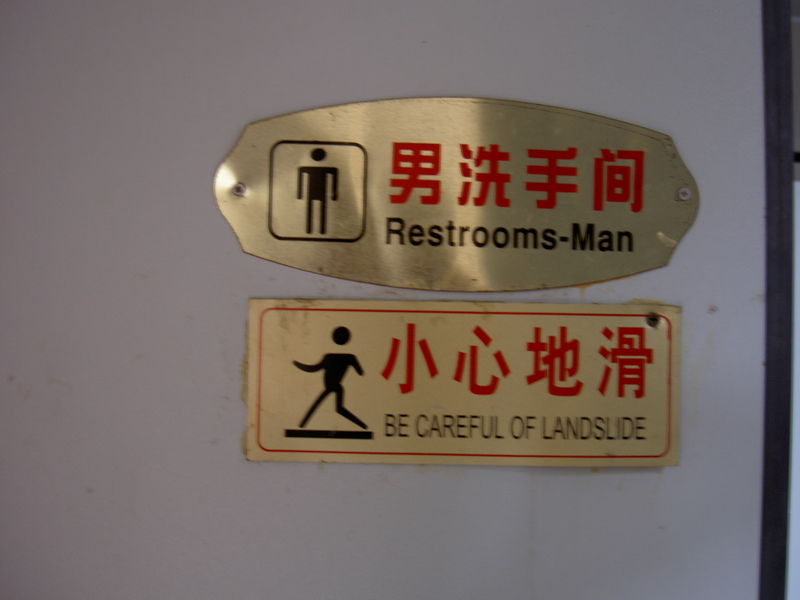 I can read the Chinese, so I understand the sign is meant to warn of a slippery floor, but the mere suggestion of a landslide hitting while I’m using the restroom will make it extremely difficult to relax. 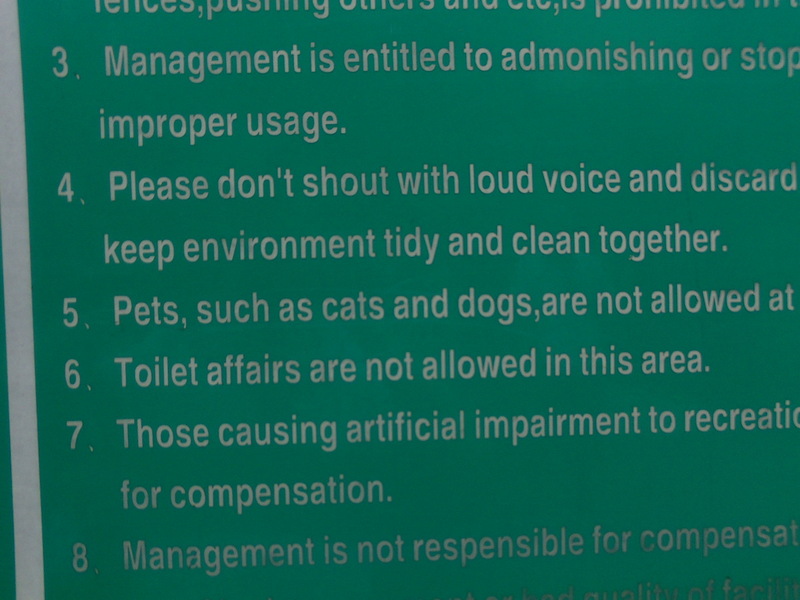 I’m intrigued by point #6: Toilet affairs are not allowed in this area. I assume the apartment management means toilets in the apartment complex cannot be used for extramarital affairs, and it bothers me that they’re trying to regulate morality in the bathroom. Congratulations to caption contest winner, Omawarisan. Doesn’t submitting a caption in the new contest sound like the perfect Sunday activity for you and your family? The Good Greatsby will reach its 100,000 view sometime today, a milestone I would not have predicted achieving in less than six months, especially when I only received 126 views in my first ten days, most of which I suspected were my wife clicking repeatedly. I appreciate all my loyal readers and the consistently great comments and I feel it’s significant to be 100,000 views closer to my ultimate goal of 7 billion views. Only 6, 999,900,000 more views to go! I like “please don’t shout with loud voice”. I agree, shouting in a whisper is much more acceptable. Congratulations on the views! I had about 15 yesterday so be warned: I will catch up to you. I’m not sure it’s their right to regulate our volume, but I do often wish people would be quiet. GG, I realize you might not read this, but I have a confession to make. 990,000 of those views were me. 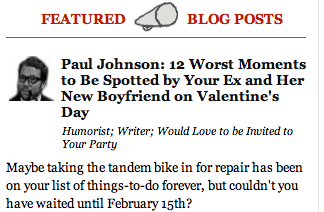 Seriously, you have one of the best damn blogs out there. Great job! Toilet affairs. *shudder* I suppose they prefer you take it to an elevator. Congrats on the big 10 er, I mean the big 100 – um, the big 100,000. Whether an elevator or a toilet, I don’t like anyone trying to regulate my affairs. So impressed that OP is taking such interesting pictures of text at his age. Gives Monster in My Closet’s read walking another spin. What an observant read-tourist. And…of course, I’m impressed with your 100,000! Well deserved and congratulations! Thank you, thank you for all the smiles and laughter. OP is a decade ahead of my level of observation. I hope by the time he reaches my age he’ll be doing something significant with his observations other than seeking irony. Congrats on the 100k, an outstanding accomplishment in such a short time. It is well deserved!! Keep on! Thanks for your continued support. I’m raising a glass to the next 100,000. Maybe number 6 means ..no going to the loo , like weeing in corners! Yea congrats on reaching a momentous number..will I ever get there..you started at the same time as me!!! I’m pretty sure #6 means no weeing on the lawn, but I prefer the more bizarre interpretation. maybe it’s the toilet affairs that cause landslides? No toilet affairs? Ok, that leaves out a significant portion of the US Congress. I blame my Super Ego. Mazel on the milestone, Greatsby! And then I read the comments. You really touched a nerve with the toilet, GG. It appears to me that the Chinese are overly-attached to Michael Jackson-type dancing. No wonder there are frequent landslides if everybody is spinning and jerking around like that. Jamie- you should have won! The pictogram certainly does seem to suggest that the proper response to a sudden landslide is to do the Hustle. Landslide: how nice of them to warn us some serious do-do was going on in there! Note to self: Don’t breathe through the nose and get your business done quickly! Also- slide across the land- hmmm- guess that makes sense for slipping. P.S. Know of anyone wanting to lose weight- follow my weight loss posts, every Monday. The program I’m doing, you lose 2-5lbs a week and it’s easy- whether someone wants to lose a quick 5lbs to someone who needs to lose 100+. I want to know about the artificial impairment to recreation – a moat around the monkee bars? Congrats on the stats – you deserve tons more reads! Congrats on your stats-you do have a great blog! Toilet affairs, I find it disgusting going into some our public restrooms. Why do some prefer to write their profanity thoughts all over the walls, although that is what is is toiletry ! I think the idea of having a toilet ‘affair’ during a landslide while Moonwalking through mountains of toilet paper is a wonderful way to end ones day. Or life. Congratulations on 100 k! Wow! Is Restrooms-Man a popular superhero in China? Does he show up wherever people are waiting in long restroom lines, proclaim that “This is a job for Restroom-Man,” and then use his superpowers to create a bunch of new restrooms? OhMyGosh I’m hit #99,998. Kind of a let-down. I’m 100,026 if that helped figure things out. Wouldn’t you be sad if you realized you accidentally were the 100,000th? “Only”… wow… We live in 2 different worlds. When I see landslide on a bathroom door, it makes me think there is a guy who regularly has explosive diarrhea. Just heard about a place in Japan where you can have your food served out of a toilet. You should totally go. You know, if for no other reason than to cause a landslide. Congrats on getting closer to 7 billion. Since when did a “swirlie” become a sexual act? As for “landslide”, I get that a few hours after I eat the chilis in kung pao chicken so it makes sense to me. Great post!